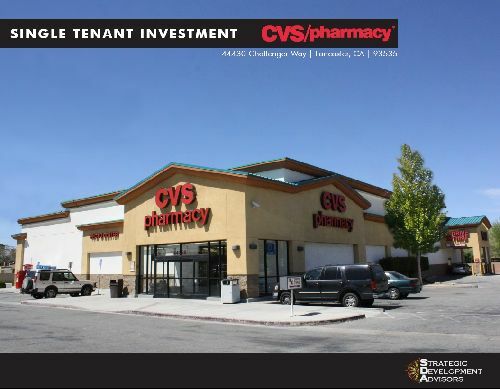 LANCASTER, CALIFORNIA – SDA (Strategic Development Advisors) has arranged the sale of fee simple interest in a free standing CVS Pharmacy in Lancaster California (Los Angeles County). The property is a part of the Challenger Square Shopping Center located at the northeast corner of E Avenue J and Challenger Way. CVS recently executed a new corporate guaranteed 20-year lease for this existing location. Seller Starpoint Commercial Properties was represented by Ara Rostamian of Strategic Development Advisors and the purchaser a California based private investor was represented by Matt Arya of Colliers International. The property traded for $5,900,000 at a CAP rate of 6 %. For more information contact Ara Rostamian at (626) 538-3057.